These teachings are a compilation of several series of lectures that Tulku Sherdor presented in 2012 in Portugal and Kingston, NY, as well as a talk given at the Dzogchen Foundation retreat at Garrison Institute in July 2011. Together they present valuable and complete instruction on Vajrasattva practice, covering the nature and purpose of Vajrasattva meditation from the perspectives of all the levels of Tantra. Included as well is a new translation and commentary on the 100 syllable mantra itself, as well as some practical exercises to become familiar with Vajrasattva meditation. 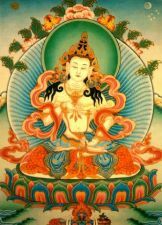 A short sadhana arrangement for Vajrasattva practice drawn from the Longchen Nyingtig treasures is also available, for which a reading transmission is also required, which you may request. Again, please email us at the contact address (on the drop-down tab above) to place your request. You will receive a response by email in kind.